We offer both semi-automated and fully-automated filling services of grease cartridges, caulk cartridges, and other jars, cans and tubs. Our semi-automated lines are great for new items and product launches, because we can run quantities as small as 500 pieces. Our fully-automated lines are used when quantities exceed 10,000 pieces. The increased speed and efficiency helps keep pricing competitive. 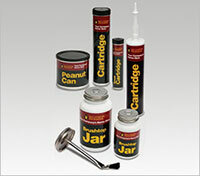 Grease cartridges are available in the standard 3oz and 14.5oz sizes, in both HDPE and fiber foil. Caulk cartridges are also available in HDPE and fiber foil, in 10oz and 32oz sizes. Sizes for cans, jars and tubs can range from 1oz to 16oz, in a variety of materials including fiber foil, HDPE, PVC, PET and polypropylene. Custom closures such as brush top lids are available. We buy in bulk and stock many of the components needed to make these packages. We in-turn pass the savings on to you providing competitive pricing even when order quantities are small.